The last decade has brought a great deal of change to serials and to scholarly communication as a whole. Serials have gone online or online only with a rapidness few expected; and many libraries now spend half or more of their materials budgets on electronic journals. 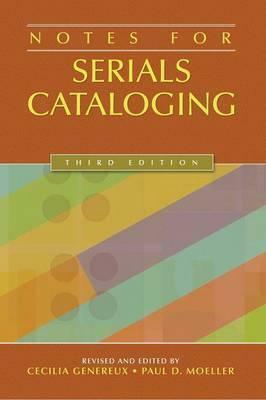 Arranged in MARC tag order and by topical subdivision, the latest edition of Notes for Serials Cataloging is designed to help both novice and experienced serials catalogers describe the complex characteristics and relationships of serial publications and construct clear and concise notes. In addition to updated definitions, scope notes, and examples of notes presented in previous editions, it incorporates notes used in electronic serials cataloging as well as covers changing practices in MARC note field usage in keeping with CONSER standards.